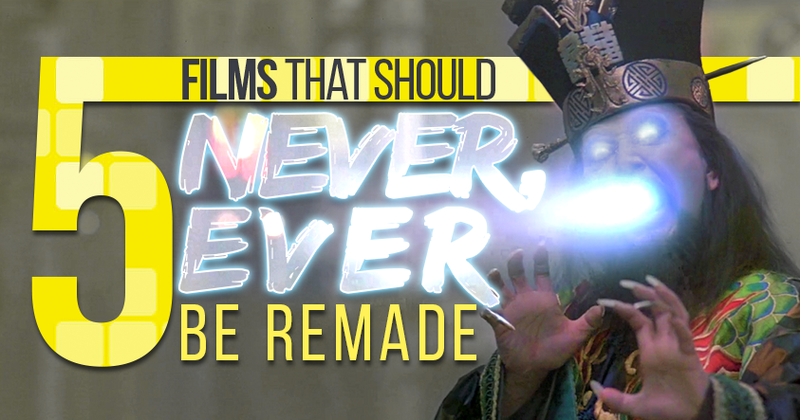 Whether we like it or not, we are living in the age of the remake. What once was old is now new as movies, television, and music reboot, reimagine, and redo things from the not-too-distant past. In the upcoming television season, we will see shows based on such movies as Uncle Buck and Rush Hour. Reboots of The X-Files, Full House, and Twin Peaks are also on their way. At the movies, the 80's and 90's are coming back to the silver screen. The Poltergeist remake and the Mad Max and Jurassic Park reboots are currently in theaters and the nostalgia train will keep on chugging with a new entry in the Vacation and Terminator franchises. A remake of a beloved film can certainly surprise, but for the most part they're futile attempts to get butts in theater seats. While there are obvious films that should never be remade-Jaws, The Godfather, Back to the Future, Psycho (oh, wait...) - here are five that also should have "hands off" written all over them (a few are, sadly, in actual development). The Lethal Weapon brand is low-hanging fruit - the buddy cop action comedy is still as popular as ever (as last year's Ride Along and The Heat proved). You can't remake perfection, and the combination of Mel Gibson and Danny Glover, as the suicidal Sgt. Martin Riggs and strait-laced family man Sgt. Roger Murtaugh, respectively, was lightning in a bottle. The chemistry between these two has been unmatched, and it's a guarantee that whoever steps in their shoes would pale in comparison. Another plus with the series (especially the first sequel) was its emphasis on stunt-heavy action and practical effects, the type of filmmaking that hardly exists anymore (Mad Max: Fury Road has become the exception to the rule). You can always make a buddy-cop action film; just don't call it Lethal Weapon.